In 2011, I received one of only 9,655 Nissan Leafs delivered to the U.S. My car left Japan less than a day before the Tōhoku earthquake and tsunami devastated the island nation. When the car arrived, I was in love. It was peppy, smooth, and quiet. It had enough range for nearly all of my driving. The five years we've had have been such good times. I was lucky that Oregon was aggressively installing EV charging infrastructure. This let me take my car on adventures all around the state. A charging station in my garage filled it up every night and I could charge at work too. This made EV ownership a breeze. Most days, I only charged in my own garage, but knowing that all those stations were there if I needed them, made it comfortable to drive around and take detours as I like. I was an active reader of the EV forums and news. There were people reporting various types of problems. Range degradation, 12V battery problems, paint issues... I was lucky that none of these problems were impacting me. Here are the stats for these five years of Leaf driving: 44,000 miles, 4100 charging events, 44 quick charges. There are Leafs out there with over 100,000 miles on them. Mine is not one of them, it was/is primarily a commuter car. After a couple years of ownership, people in Arizona and southern California started complaining of excessive battery degradation. The weather here in Oregon is much more battery-friendly (reason #6), but I was interested to see how the batteries performed as they aged. How have the batteries of the Nissan Leaf held up after 5 years? There are two simple ways and to gauge the battery health and one more difficult (but more accurate) method. The first method is the Capacity Bars. There are 12 small marks just to the right of the "fuel gauge". These are the battery health indicators. The top bar (or 12th bar) turns off when the battery has lost 15% capacity. Bars 11 - 4 each represents 6.25% of capacity. This is an easy way to see the battery health, but it is a course measure. Currently, my car is at 80% capacity and it still has 11 bars. The second method of determining range is to charge the car fully and to look at the range meter (referred to as the guess-o-meter (GOM) by many Leaf drivers). This is not a very accurate method since the value depends on how you have been driving the car recently. This means the results are not consistent or reproducible. Here are three snapshots of the range meter starting with the car when it was new, to one that I snapped just after the 5 year mark. I should point out that even though you see 118 miles reported when the car was new, I was never have been able to achieve such a range. Even the 69 miles that the GOM reports today is optimistic; as you'll see with the final method below, the range is less than 60 miles. The 3rd and most accurate method is to use Leaf Spy. I found this tool just after having the car for 2 years. 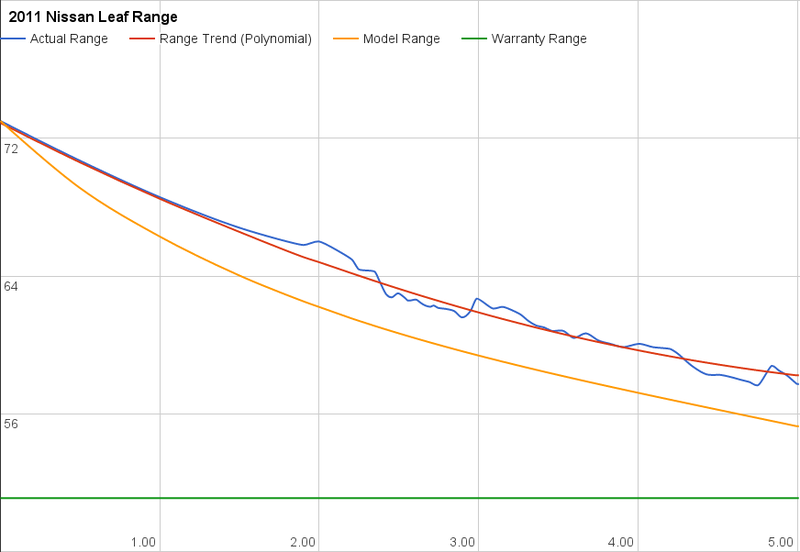 Since then I have been logging readings and made the chart below of the battery pack's performance. Let's unpack this graph. The blue line is measured range. You can see how there are seasonal changes with the weather. The red line is just a normalized version of the blue line. Removing the seasonal noise gives you a clear view that the capacity degradation is slowing. In the first year, the range dropped by about 4 miles. In the last year (4 to 5), however, there was less than 2 miles of range lost. The yellow line is the average of all the vehicles that have been self-reporting on MyNissanLeaf. My car is doing much better than this average. This is most likely due to the lowish miles and the mild climate. It's nice to see the degradation slowing, but it is accumulating. This has meant that we are now using the fast chargers more than we were previously. I am concerned that this could accelerate the degradation. We'll see. I should note that this is just one example. Additionally, Nissan improved the Leaf battery chemistry in 2015 (known as the Lizard Battery). This new battery could have a different degradation curve. The Nissan Leaf has a telematics system called NissanConnectEV (formerly known as CarWings). The app lets you check the state-of-charge and turn on the HVAC. The status updates for this telematics app are over-the-air. The list of charging stations in the car's nav system is also updated over-the-air. The car uses the AT&T 2G network for these data transfers. The 2G network is scheduled to be shutdown. The 2G shutdown date has been delayed multiple times. It is currently scheduled for the end of 2016 and AT&T seems serious about keeping to the date this time. When the shutdown occurs, my car (and all the 2011 through 2015 Leafs) will need to be updated to a 3G or 4G modem. I'm not sure how much this 3G/4G upgrade will cost. I rarely use CarWings, so I am not willing to pay much for the upgrade. Nissan has said that cost information will be available in "late summer of 2016." This is something that I'll have to deal with in year six. 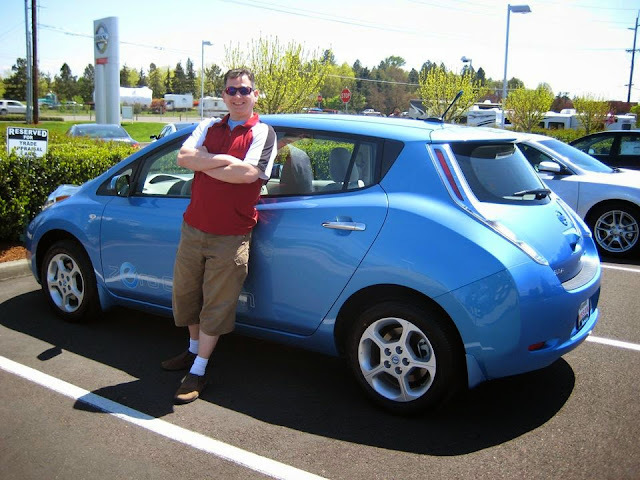 When I purchased my Nissan Leaf in 2011, it was intended to be my commuter vehicle. I have a 21 mile round trip commute. This is perfect for a short range EV. The 73 mile EPA rated range of the 2011 Leaf gave me plenty of room to spare for errands, HVAC use and the battery degradation that I knew would come as the car aged. That was the plan and for four and a half years, things went according to the plan. We took the Leaf on a few road trips to check out the West Coast Electric Highway, but for the most part, the Leaf was the commuter and errand mobile. I wanted to take care of the batteries in the Leaf. I was not leasing the car, I bought it and I wanted to make it last 10 years if I could. To this end, I used the Long Battery Life setting in the car. This only charged it up to 80%. Also, I set the charge timer so that is started charging at 3AM. This had the car fully charged by 7AM and the batteries would not stay charged up for too long before my morning commute discharged them. Lithium Ion batteries are the least stressed in the middle third of their charging range and this method had them there about 16 hours each day. For long trips we took the usually took the Prius. The Prius, however, was ended when an Uber driver in a Highlander ran a stop sign as he raced to pick up a fair. The Prius was totaled. As you can see the new pattern is much more demanding. There are many more charging events and the drive to school and back has a 700 ft hill climb. That is 4 times per day over that hill (hence the 100% charges). Summer is almost here and the school trips will end. Next year we're transferring schools, so the trip will be much easier both for the driver (less traffic) and for the batteries (no big hill). When the Leaf was new, this drive would not be a problem with an 80% charge, but now with the batteries ageing, 100% is needed to make sure the needed range is there. The Leaf has also had to fill in on longer drives where we would have taken the Prius. Trips to Woodburn and Gresham have meant that we are stopping at DC fast chargers. This too has a wear and tear impact on the batteries. I didn't have Leaf Spy for the first 2 years, so that data is assumed based on the battery model that the known starting point and the measured values give us. You can see from the table that there is a notable range loss each year. As the car ages, the loss is reducing, but the effects are still adding up. For my fixed commute, there is still plenty of range. And my workplace has EV charging as well, this would allow me to use it even when it was down to ~20 miles of range. For a more spontaneous needs, however, at less than 60 miles, the range is not enough. This is one reason that the 200 mile range cars are needed. With a longer range comes a larger battery pack and more cells. This means that each cell is individually worked less. When the motor needs 80 kWs of power, there are many more cells to distribute the demand across. Due to circumstances that we had no control over, we have recently asked the Leaf to do more than we intended it to do when we bought it. It has handled this challenge extremely well, especially given the age of the batteries. Tesla is now taking preorders for the Model 3 and ~400,000 people have put down $1000 to raise their hand and get one. In their latest ad campaign, Nissan is hoping to take advantage of this outpouring EV-love and persuade a few people to buy a Nissan Leaf today, even if they are planning on getting a Model 3 in 2018. This is not a bad plan. I plan on driving my Leaf until it is traded in on a Model 3. 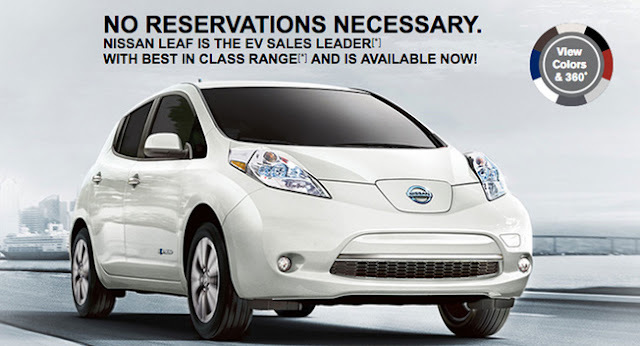 I hope more people start driving EVs soon and that our community grows, but Nissan's ad was still a jab at Tesla. GM too has taken jabs at Tesla saying that they don't need $1000 pre-order funds to build a car. It's true that the Leaf is for sale now and that the Chevy Bolt will be out before Model 3 and you don't need to put down $1000 (and wait 18+ months) to get a Chevy Bolt. So why aren't there ~400,000 people lining up at 6AM to get Leafs and Bolts? Is it the rockstar CEO quality of Elon Musk? Maybe. He has been compared to Steve Jobs, Thomas Edison, and even Iron Man's Tony Stark. Is it the car's cool tech like the 17" touchscreen and cars that can drive themselves? Maybe. Is it the vast free-for-life, solar-powered EV charging network available only to Tesla drivers? Maybe. All of the above carry some weight and have been discussed many times over. I'd like to propose another idea. 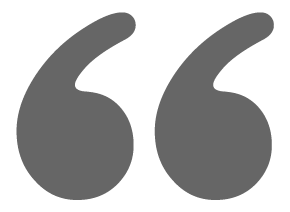 In the opening, there is a quote from Desmond Tutu. (sidebar: I am not trying to equate the first world problem of 'which car should I buy?' to the South African human rights struggle.) This quote speaks to a part of the human nature that wants to be treated fairly; it speaks to knowing that we matter. Let me be clear, Desmond Tutu was talking about something far more important. No one wants to be treated like a second class citizen. If you are buying an EV from a traditional car company (Nissan, GM, Ford...), you are likely to be treated like a second class citizen at some point. If you read EV forums, you'll find story after story of people that go to a dealership to buy an EV and the sales guy directs them towards a gas car. The salesman talks about all the "problems" with EVs. If you manage to fight through this and you do get an EV, then 3 months later you get a free oil change coupon in the mail. Even with EVs on salesroom floors and better EV projects in the works, the traditional car companies and dealerships make the vast majority of their money from gas cars and gas cars will continue to be their primary focus for many many years. The perfect example of this was in January '16 when GM CEO Mary Barra said, "We are not actively working on providing [recharging] infrastructure." For EVs to be successful, you need a coast to coast highspeed recharging infrastructure. But the traditional car companies are not all-in on EVs, so it does not matter to them if EVs are successful, or just a small volume market niche. 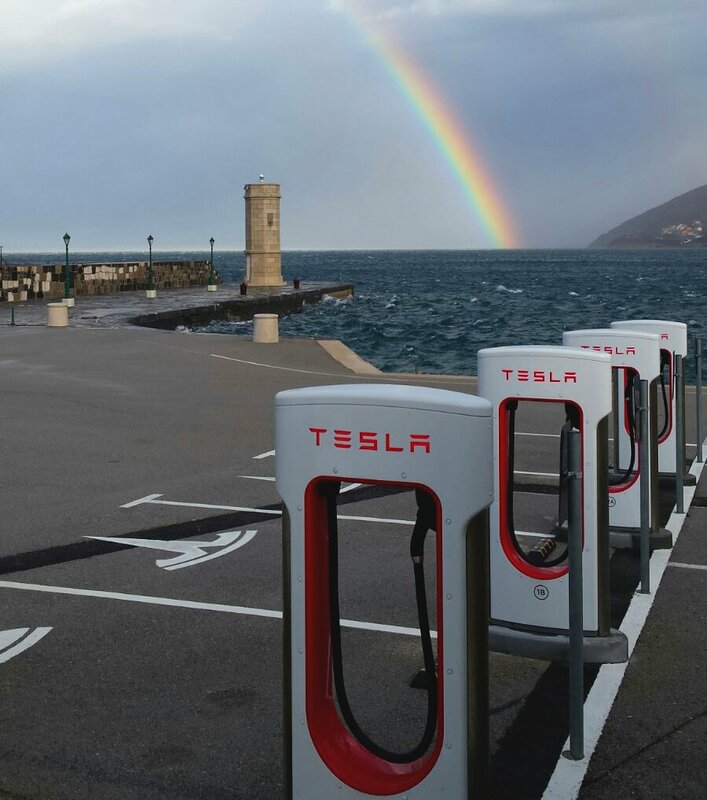 Tesla, on the other-hand, has built a vast worldwide recharging network and they are continuing to grow it. If being a pure play is all that it takes, then this devotion would flow to any EV start-up and maybe some aspects of it do, but Tesla earns its vast following and devoted fans because it has a complete package. Their products are not a compromise. They are not doing it because a government regulation requires it. Their cars are not something that is a modified version of a gas car with the minimum number of changes required to make it work. Tesla has purpose. It is a movement, not a product. And they have all the things listed above: the cool tech, the future vision, the vast, free-for-life, solar powered recharging infrastructure, and yes, the rocket man CEO. Every vehicle that Tesla has made, to date, has used the 18650 Lithium ion battery cells. This was true for the Roadster, Model S, and Model X. Each car uses about seven thousand 18650s. Model 3 will be different. 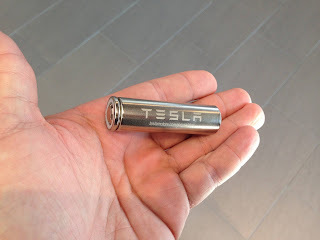 For the Model 3, Tesla will be making the batteries themselves in the Gigafactory and they have already said that the battery will be different. The only details about the difference that has been mentioned is that cells will be bigger in each dimension and it will have better energy density than the battery cells that are being made today. 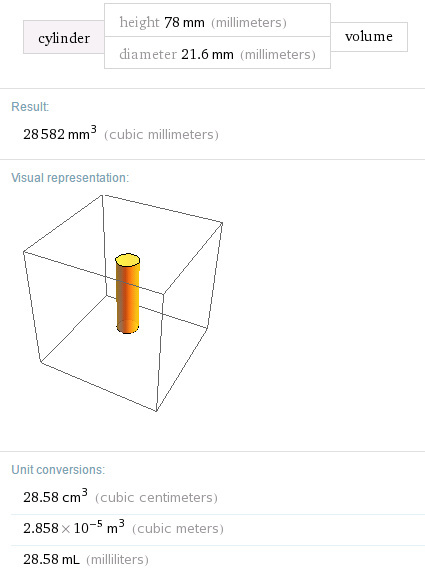 The 18650 is so named because it is 18 mm in diameter by 65 mm height and there is no Z-dimension because it is a cylinder, not a rectangular prism. So how much difference would 20% size increase make? The answer is more than you might think. Volumetrically it resulted in far more than a 20% increase. Let's compare the old battery cell and the potencial new one. 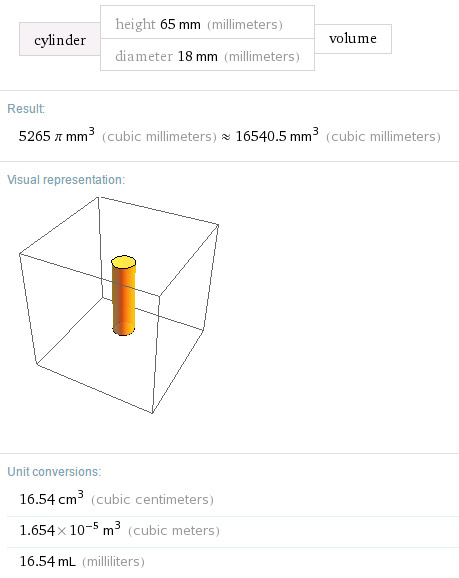 Letting our friends at Wolfram Alpha do the math, the volume of 18650 is about 16.5 millimeters. The new volume is about 28.6 milliliters. That is ~170% of the old battery cell volume. That is 70% more room for anodes, cathodes, and all the things that make a battery work. How Many Battery Cells Will Be In The Model 3? As Tesla's smallest vehicle, the Model 3 will be the most aerodynamic vehicle they make when it comes out. To have 215+ miles of range the car will need at least 50kWh of battery capacity. For a given range, Model 3 will only need about 2/3rds the capacity of its Model S big brother. This along with battery cells that hold 70% more capacity means that Model 3 will need far fewer battery cells per vehicle. Starting with the 7,000 cells in Model S, then reducing it by 2/3rds for the smaller car and then reducing it by 40% for the higher capacity yields ~2750 battery cells for Model 3. These are, of course, rough guesses based on a single comment from Elon Musk during a quarterly results conference call, but I think it is safe to say that Model 3 will have less than half the number of battery cells compared to the current 7,000 of Model S/X. There is no doubt that EVs are changing the way that we view and interact with cars. It makes them fun again. EVs are also technology leaders that are bringing connected cars and autonomous driving to market faster than their gas cousins ever would have. I'm interested in learning about consumers' perspectives and experiences of choosing to buy and own an EV. As a market researcher and ethnographer, I study the relationships between consumers and culture, how each effect the other and what that means for changes in consumption practices. With respect to EVs, I'm theorizing how the automotive culture is changing and the ways these changes impact consumers. I often talk to people in their homes and garages or in coffee shops and cafés; meeting at a Starbucks is usually a comfortable place for most people to meet. I'm planning on being in Portland the week of May 9-14, 2016. I'm happy to meet with Tesla and Leaf club members any day that week. Right now I have an open schedule to accommodate member needs. If you are interested in meeting with Diane, leave a comment below and I'll PM you her contact information.